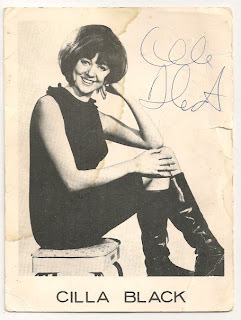 This is a rare NEMS promotional card for Cilla Black, the only female artist on NEMS books. Promotional cards for NEMS artists other than the Beatles can be hard to find, and although not highly valuable they are certainly of great interest to collectors. This card is also signed by Cilla herself, although autopenned versions exist. Let's Go Down the Cavern..and the new one too!